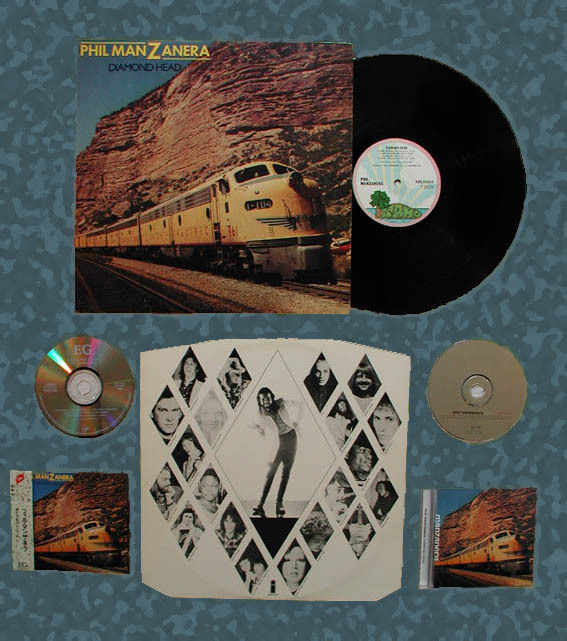 In 1975, Manzanera's debut solo album was hailed as a milestone of delightful rock. Rightly so, and this assessment stands today with equal validity. Gathered on this album are some of the most notable talents from the British eclectic pop scene of the early '70s: Brian Eno, Robert Wyatt, John Wetton, Eddie Jobson, Andy Mackay and more. Expect a passionate blend of uptempo pop and serious rock, a truly inspired dose of tunes that rank even today as unparalleled sonic achievements. Tasty and thought-provoking, this music alternates from vocals to instrumental pieces, striving toward (and achieving) emotional highs that will leave you breathless no matter how many times you listen to this album. The combination of pop and prog surges like a cheerful volcano. Vocals alternate between songs. When a fanciful voice is required, there's Wyatt's ethereal tremble-throat; when deep authority is required, there's Wetton's commanding style; when festivities are called for, there's Eno's eerie pop vocals. Manzanera's guitar soars, twirling in the air with nimble-fingered pyrotechnics. His crisp riffs snare catchy melodies with carefree abandon, mixing them with sly intent with sinuous basslines, intricate percussion, keyboards of energetic nature, and truly innovative electronic effects. And don't forget the swing saxophone or the swirling violin. The mix is well-balanced, structured so that each instruments' melodies are allowed time to shine as the center of attention. Yet these moments all flow together, becoming grander and superb with their interaction. Car Rhumba was originally used as the B-side to Flight 19 in 1977 and was added to the 2000 CD re-issue. The song Frontera was released as a picture sleeve single in Germany with Same Time Next Week as its b-side. Car Rhumba This track was left over form the Diamond Head sessions. Frontera '91 This is an instrumental re-recording. Phil Manzanera Guitars On "Frontera", Guitars On "Diamond Head", Guitars, Tiple, Fuzz Guitar On "Big day", Guitars On "The Flex", Guitars On "Same Time Next Week", Guitars, Organ, Piano, Bass, Handclaps On "Miss Shapiro", Guitars On "East Of Echo", Guitar On "Lagrima", Guitars, Organ, Tiple, String Synthesizer, Vocals, Fuzz Bass On "Alma", Guitar On "Car Rhumba"
Paul Thompson Drums On "Frontera", Drums On "Diamond Head", Drums On "Big day", Drums On "The Flex", Drums On "Same Time Next Week", Drums On "Miss Shapiro", Drums And Extra Drums On "East Of Echo", Drums On "Alma"
John Wetton Bass On "Frontera", Bass On "Diamond Head", Bass On "Big Day", Bass On "The Flex", Lead Vocals, Bass, Mellotron On "Same Time Next Week", Bass On "East Of Echo", Bass On "Alma"
Robert Wyatt Lead Vocals, Timbales, Cabasa, Background Vocals On "Frontera"
Eno Background Vocals On "Frontera", Guitar Treatment On "Diamond Head", Vocals On "Big day", Vocals, Rhythm Guitar, Piano, Handclaps On "Miss Shapiro", Guitar Treatments On "East Of Echo"
Eddie Jobson All Strings, Fender Piano On "Diamond Head", Electric Clavinet On "The Flex", Synthesizer On "Alma"
Brian Turrington Bass On "Big day", Bass On "Miss Shapiro"
Andy Mackay Soprano, Alto Sax On "The Flex", Oboe On "Lagrima"
Doreen Chanter Lead Vocals On "Same Time Next Week"
Sonny Akpan Congas On "The Flex", Congas On "Car Rhumba"
C.Hanu Drums On "Car Rhumba"
D. Heibs Bass On "Car Rhumba"
M. Feza Trumpet On "Car Rhumba"
Bill MacCormick Handclaps On "Miss Shapiro", Fuzz Bass Themes On "East Of Echo", Vocals On "Alma"
Charles Hayward Percussion On "East Of Echo"
Dave Jarret Keyboard Themes On "East Of Echo"
Ian MacDonald Bagpipes On "East Of Echo"